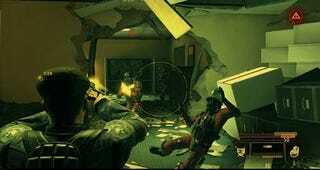 Alpha Protocol is a role-playing game disguised as a fast-paced third-person shooter. In the game you play as a highly customizable Michael Thorton, a CIA field agent on the run from his former superiors. Developers Obsidian Entertainment describe the game as a modern-day espionage role-playing game, but it plays just like a shooter. That's not surprising since the game is being developed by the same team that created Star Wars: Knights of the Old Republic II. The first thing I got a look at was one of Thorton's many safe houses. It's here that you can customize your character's clothing, weapons, gadgets and upgrade his skills. Thorton can be upgraded through ten different skills, all of which can have significant impact on the type of character he is from brawler, to techie, to smooth James Bond spy. Weapons are broken down into four categories with mods for each which essentially buff or nerf the gun. There are also armor mods for Thorton. Some of the skills I saw in action included one that slowed time down while Thorton took enemies down with melee attacks. Another scanned an area for enemies, allowing Thorton to pop up and take them down quickly with his gun. I was most intrigued by the way the weapons operate. Since the game plays like a shooter, but is actually an RPG, Obsidian had to find the right mix to reflect both styles of play. What they ended up with was a system that used your skill ratings and the weapon type to impact the size of your targeting reticule. The more skilled you are with a weapon, the better the weapon is, the smaller the reticule is. So when you're fire off shots with a gun you're not proficient with, your reticule is pretty big and the shots can go anywhere in that targeting circle, either hitting or missing your target depending on how much space they take up in the reticule. It's a great way to have skill levels impact a shooter without taking control away from the player. I'm really looking forward to how this game shapes up as it nears it's October release date for the PC, PS3 and Xbox 360.